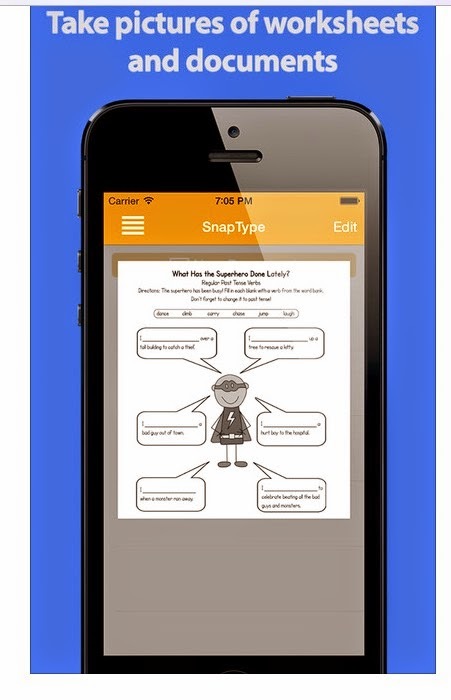 App Review - SnapTypePro - - All Things Special Ed. I have found a new app that I LOVE !! 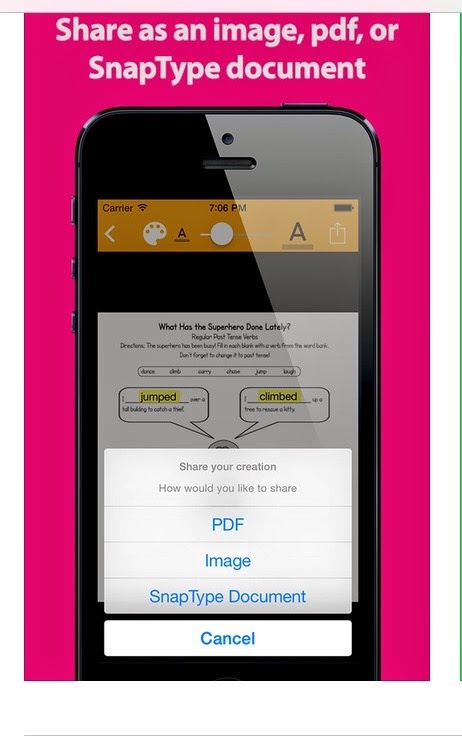 The app is called "SnapTypePro" which you can purchase from the app store in iTunes for $2.99. You can also try out a free version called "SnapType". 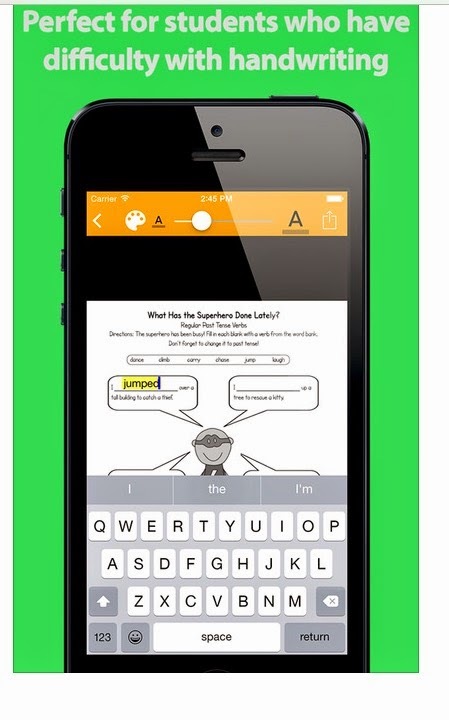 This app was designed for those students who struggle with handwriting, and for us teachers who have a hard time reading their handwriting. 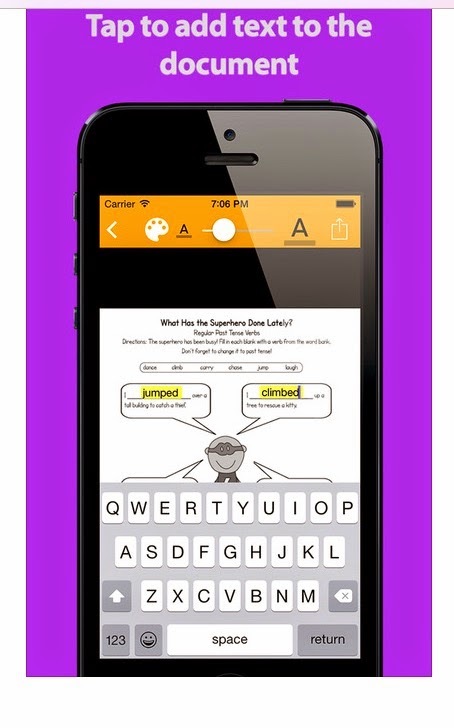 Students can easily complete worksheets with the help of the app on an iPad of iPhone. The teacher or student takes a picture of their worksheet or import a worksheet from their device. They use their iOS device keyboard to add text to the document and then when they are finished they can print, email, or share the document. To start typing, you just have to touch where you want to type on the screen. If you need to, you can then move your text or adjust the text size. Documents can be saved and you can customize folders. When you complete your document simply save it as a PDF, an image, or a SnapType document. SnapTypePro will also let you you crop images, rotate images, work in landscape mode, choose between text colors and convert images to back and white for better printing. I have two students that I think this will definitely be a tool we will try out and use a lot. This will increase their independence in the regular education classroom as well as my resource room. I can not wait to try it out. Unfortunately I am on spring break this week so it will have to wait till we return. I will update as soon as we do!! I wanted to share this right away in case any of you think you could use this- let me know if you try it out and how you like it. What a great app! I must remember this one for my return to the classroom. 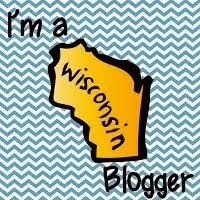 Thanks for the review, and for sharing! I look forward to following you.